Dog parks are some of the happiest places on earth. When I was in vet school, I didn’t have a yard and I loved taking my dog to an area where she could run off leash and socialize with other dogs. It was a great stress reliever to sit there and watch all of the happy pups playing together. However, it wasn’t always smooth sailing. Sometimes there were aggressive dogs or owners, little kids that didn’t know boundaries or sad pets that were left alone in the park like it was a doggie daycare. As a veterinarian I have been lucky to see very few emergencies from the dog park, but unfortunately there is a risk to letting your dog play with a lot other strange dogs. Here are some dangers to warn your owners about regarding the dog park. I got to see Dr. Little speak at the AVMA conference and she really is passionate about ticks. It's awesome to see a veterinarian completely enamored in his or her specialty, even if I think ticks are disgusting. It's important to know the different tick species in your area and the various diseases that they carry. 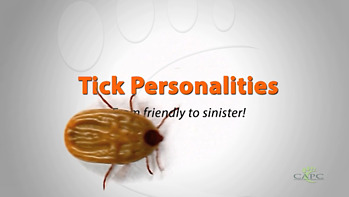 Owners will definitely bring in tick specimens when they find them and it will be up to you to identify them on the spot.